ASOS Brown Jersey Top Size 12 Stretchy Condition is Used Dispatched with Royal Mail 2nd Class Thanks for looking, please check out my other items. Asos Size 6 Leopard Dress Jersey Fit & Flare Belted . Condition is Used. Dispatched with Royal Mail 1st Class. Asos White Extreme Flare cotton trousers. Light brown. Never worn. Size 18. Asos Ladies White Hooded Top Size M. Condition is Good . Dispatched with Royal Mail 2nd Class. Soft, stretchy material that is like jersey. ASOS Ladies Brown Top. Back button fastening. BNWOT ASOS dress. Part of the beautiful more expensive ASOS White range. It has two tones of colour. Almost a milk and chocolate brown colour. It can be worn as a shirt dress or worn open. Detail is beautiful with stand up collar and discreet side pockets and discreet front button fastening. Beautiful brown strappy dress. Elasticated rear panel. Layered square neckline. Separate matching ribbon belt. A beautiful Asos dress in a praline brown - size 8. 3/4 sleeve. Asos Khaki / brown turtle neck jumper size 12. Only worn once in great condition. NEW ASOS DESIGN Cord Jacket with Borg Collar in Rust - UK 8. Condition is New with tags. 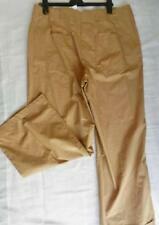 Nwt asos trousers. Inside leg full length approx 75cm. Picture shows 1 leg rolled up too. 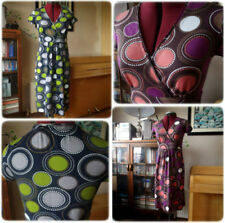 Waist approx 80 cm. Cute ti ger/ animal print (see pic 3), with black contrast trim detail around the waist, nice stand out flared skirt, with embroidery Skulls (in blue thread ) ar ound the hemline - see pics 1 and 4 for the skulls! Marked size16, but probably more a size 14. in khaki. There is a large bow to the front. ASOS DESIGN bandeau Jersey dress with Wrap detaill. Bandeau neck/ Strapless design. Chocolate brown jersey. Maxi dress with side wrap design. Dress has beautiful pleat detail at the top. pleat detail also down front of dress. Cute ti ger/ animal print (see pic 3), with black contrast trim detail around the waist, nice stand out flared skirt, with embroidery Skulls (in blue thread ) ar ound the hemline - see pics 3 and 4 for the skulls! Vila Decour skirt size small (10). In taupe cotton. Metallic thread embroidered flowers. Floral inserts in cream and peach. Lined. Underskirt has satin and crepe contrasting fabric. Raw edges. 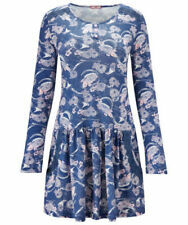 ASOS Leaf Print Long Sleeve Jersey Dress Size 14. In good condition. From a pet and smoke free home. Dispatched with Royal Mail 2nd Class. ASOS Dress - Size 14. This is a fab dark brown slinky jersey dress. There is draping detail to the shoulder and one side is longer and gathered to create a side drape effect. The fabric is 100% cotton. Denim Jackets. Denim Waistcoats. Size Guides. Style: Cotton. Material: 100% Cotton. Main Colour: Brown. Size Guide. Are intact. There may be the odd light handling mark, however, nothing that I've spotted. Style: cargo. Top Quality. 30 moneyback warranty. SWIFT: INGBPLPW. IBAN: PL 34 1050 1298 1000 0091 1688 1989. Bank account details Size and fit are approximations and may vary across designers. 3XL 60 30 118 50R XXL. The fabric is 100% cotton. Style: Cardigan. Denim Jackets. Denim Waistcoats. Size Guides. Material: 100% Cotton. Main Colour: Brown. Size Guide. ASOS- BROWN/ BLACK TIGER PRINT STRETCH JERSEY MAXI SKIRT- SIZE 10-VGC! THIS IS A NEW LIGHT BROWN, TAUPE, COLOURED COLLARED JUMPER FROM ASOS IN A SMALL MAN SIZE. ASOS Maternity. Waist length padded jacket with a hood with drawstring ties, zip & velcro fastening down the front and zipped side pockets. Machine wash at 40°. Care instructions. Lining: cotton 100%. The fabric is 100% cotton. Denim Jackets. Denim Waistcoats. Lee Cooper. Style: Wrap Top. Size Guides. Material: 100% Cotton. Main Colour: Brown. ASOS Maternity skater dress with lace up front and tie back. Size 14 UK. Cotton and elastane. BROWN SHORTS NEVER WORN SIZE 16 ZIP FLY BACK PATCH POCKETS. Nice and thick heavy cotton material in brown. You have a chance to buy this ladies sweatshirt by Asos. beige/ brown. size 10 / armpit to armpit 20"/ length from shoulder 25". Your life is eclectic and unexpected and, now, so is your wardrobe. ASOS BNWT Linen Shorts. Shorts by ASOS DESIGN. Body: 74% Linen, 26% Viscose. Follow the instructions before you wash them. Regular fit. ASOS Maternity skater dress with lace up front and tie back. Size 10 UK. Cotton and elastane.